Many users wish to present slideshows in the comfort of their living room, using their TV set and a DVD player. While this does no justice to the quality of FotoMagico slideshows, FotoMagico helps you create a DVD of your slideshow. FotoMagico does not burn a DVD directly. Instead it creates a QuickTime movie file and relies on third party software like Roxio Toast Titanium or Apple iDVD to burn the DVD. Television sets come in two different shapes: traditional TVs with 4:3 aspect ratio and widescreen TVs with 16:9 aspect ratio. To make sure that your slideshow looks good on a wide range modern TVs, we recommend that you create your slideshow with a 16:9 aspect ratio. The 4K choice when creating a new slideshow document is the best choice for this, because it creates a high resolution 16:9 slideshow. 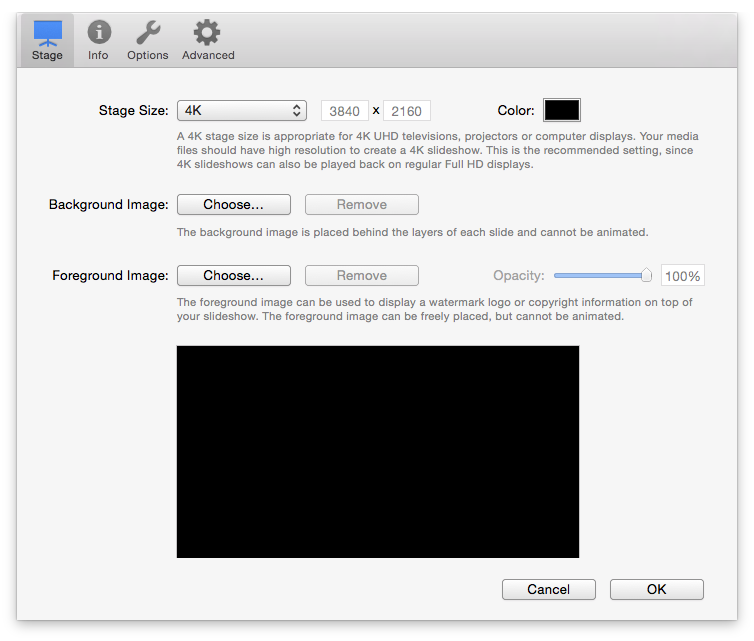 If you already have an existing slideshow with a different aspect ratio you may want to go to the slideshow settings and change the Stage Size by selecting Settings… from the Slideshow menu. Slideshows that do not have the correct aspect ratio can be made to match the aspect ratio of your TV screen. There are two different choices: Letterboxing and cropping. Letterboxing adds black bars at the top and bottom of the image. Cropping cuts away part of the image to make it match your TV. Pillarboxing is a rare case: it adds black bars to the left and right of the image and only happens if you present a 4:3 slideshow on a widescreen television. Select the DVD… option from the Share menu. An assistant will appear that guides you through steps necessary to create a DVD. DRM protected audio files cannot be used. We recommend that you burn those songs to an Audio CD in iTunes and reimport them back into iTunes. This strips the DRM protection from the audio files and will lead to minor loss of audio quality, but the resulting audio files can be used without any restrictions. Please refer to the iTunes Help for details on burning Audio CDs and importing songs. Select the application which should be used to burn the DVD (Roxio Toast Titanium or Apple iDVD), the video standard (NTSC or PAL), and the aspect ratio (16:9 or 4:3). The 16:9 choice is only available if the stage size of your slideshow is 16:9 or wider. If the aspect ratio of your slideshow and the aspect ratio does not match, then a yellow warning will be displayed at the bottom of the page. In this case you need to decide whether the slideshow should be letterboxed or cropped to match the aspect ratio of the DVD. Letterboxing will add black bars at the top and the bottom of the image, while cropping will cut away parts of the image to make it match the aspect ratio of the DVD. Anamorphic Pixels (non-square pixels) is an option to improve output quality, but is only useful for some DVD burning applications. 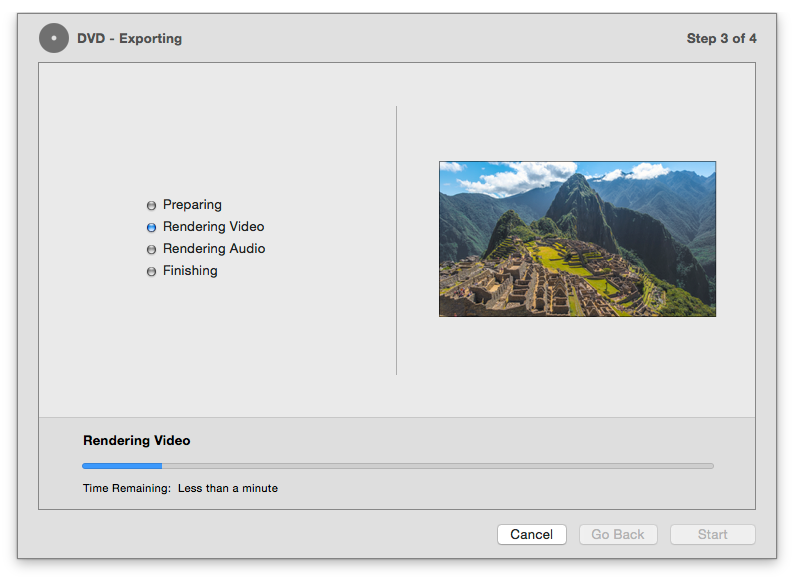 High quality also improves output quality but takes a lot more space on your disk and requires a longer time to render. The preview on the right side will show you what to expect from each choice. Use the left and right arrow buttons below the preview to step through each slide of the slideshow. Specify where the intermediate QuickTime file should be saved. 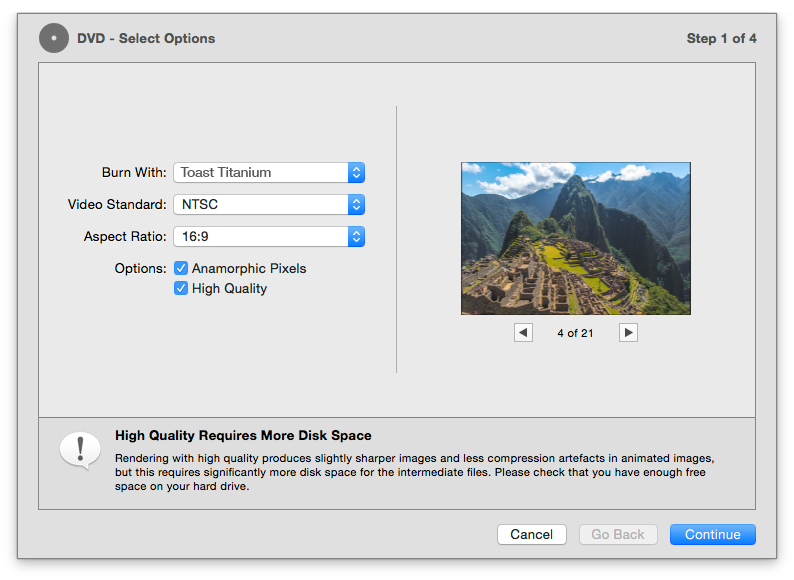 This QuickTime file will be used as input for Toast Titanium or iDVD. 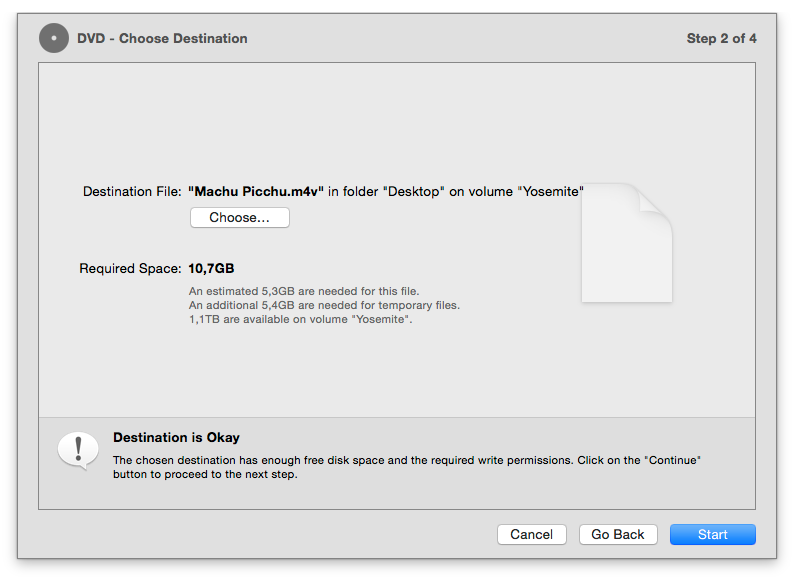 FotoMagico will suggest a reasonable filename and destination folder. If you want, you can change the filename or destination folder. Please make sure to select a folder on a volume that has enough free disk space. Also make sure to only select a folder for which you have write permissions. Please note that the required disk space is also displayed. This required space is the sum of the estimated size of the final output file and the size of temporary files. The slideshow has been exported to a QuickTime file and saved in the folder that you specified earlier. Now this file will be opened in the DVD burning application that you selected before (Toast Titanium or iDVD). From here on, you leave FotoMagico and continue your work with the DVD burning application. For details on working with the DVD burning application refer to the Toast Titanium or iDVD help pages. Should automatic opening of the QuickTime file in the DVD burning application fail for any reason, then launch the DVD burning application manually, and then drag the QuickTime file from the Finder to the DVD burning application. Please note that Boinx Software will not be able to offer support for Apple iDVD or Roxio Toast Titanium. Should you have problems using these applications, please contact Apple or Roxio customer support.